édité le 05/11/2018 - Plus de news de "GAZPROM" - Voir la fiche entreprise de "GAZPROM"
- OMV AG is Gazprom's main partner in Austria. The companies cooperate in gas production, transportation and supplies. - Since 2017, OMV has been partnering with Gazprom in the Yuzhno-Russkoye oil, gas and condensate field development. 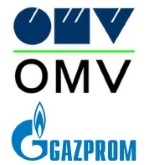 - On June 5, 2018, an Agreement was signed to extend until 2040 the existing contract between Gazprom Export and OMV Gas Marketing & Trading GmbH for Russian gas supplies to Austria. The contract had been valid until 2028. - June 1, 2018, marked 50 years since signing the Agreement on natural gas supplies to Austria. - On October 3, 2018, Gazprom and OMV signed the Basic Agreement on Asset Sale. - On October 4, 2018, Gazprom and OMV inked the Memorandum on Strategic Cooperation. - In 2017, Gazprom set a new record for gas exports to Austria at 9.1 billion cubic meters, a rise of 50.3 per cent (3 billion cubic meters) from 2016 (6.1 billion cubic meters) and 33.7 per cent (2.3 billion cubic meters) from 2005, when the previous record had been reached (6.8 billion cubic meters). OMV is producing and marketing oil and gas, innovative energy and high-end petrochemical solutions – in a responsible way. With Group sales of EUR 20 bn and a workforce of around 20,700 employees in 2017, OMV Aktiengesellschaft is one of Austria’s largest listed industrial companies. In Upstream, OMV has a strong base in Romania and Austria and a balanced international portfolio, with the North Sea, the Middle East & Africa and Russia as further core regions. 2017 daily production stood at approximately 348,000 boe/d. In Downstream, OMV operates three refineries with a total annual processing capacity of 17.8 mn tons and more than 2,000 filling stations in ten countries as of year-end 2017. OMV runs gas storage facilities in Austria as well as in Germany; its subsidiary Gas Connect Austria GmbH operates a gas pipeline network in Austria. In 2017, gas sales volumes amounted to 113 TWh.